- Publisher "The Blackwell Companion to the Bible and Culture" provides readers with a concise, readable and scholarly introduction to twenty-first century approaches to the Bible. ^Consists of 30 articles written by distinguished specialists from around the world^^ ^Draws on interdisciplinary and international examples to explore how the Bible has impacted on all the major social contexts where it has been influential - ancient, medieval and modern, world-wide^^ ^Gives examples of how the Bible has influenced literature, art, music, history, religious studies, politics, ecology and sociology^^ ^Each article is accompanied by a comprehensive bibliography^^ ^Offers guidance on how to read the Bible and its many interpretations. 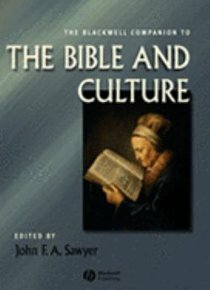 About "The Blackwell Companion to the Bible and Culture"
"The Blackwell Companion to the Bible and Culture" provides readers with a concise, readable and scholarly introduction to twenty-first century approaches to the Bible. ^Consists of 30 articles written by distinguished specialists from around the world^^ ^Draws on interdisciplinary and international examples to explore how the Bible has impacted on all the major social contexts where it has been influential - ancient, medieval and modern, world-wide^^ ^Gives examples of how the Bible has influenced literature, art, music, history, religious studies, politics, ecology and sociology^^ ^Each article is accompanied by a comprehensive bibliography^^ ^Offers guidance on how to read the Bible and its many interpretations.